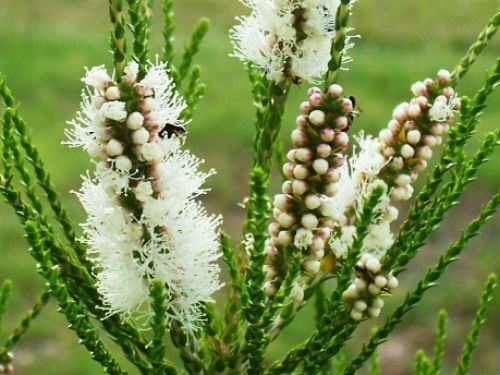 Melaleuca huegelii is known as the Chenille Honey-myrtle. This species may develop into a tall shrub reaching a height of five metres. The specimens, in our cold climate garden, reach two metres in height.Leaves are small, almost triangular in shape and aromatic. The flowers are held in terminal spikes, pure white and cover plants in early summer. Blooms are a magnet to many native insects including Blue Flower Wasps and various colourful Chafer Beetles (see Spotted Flower Chafer article). New growth grows out of the ends of flower spikes. Melaleuca huegelii is a native of Western Australia and is found on the southwest coast. Both foliage and flowers are attractive features. We have found that this species is free flowering as well as drought and frost tolerant. Plants respond to the occasional light prune.